The new all-new 2018 Kia Niro is proving itself among the ranks of affordable crossovers. This newest model Kia has received a Top Safety Pick (TSP) and Top Safety Pick Plus (TSP+) rating from the Insurance Institute for Highway Safety (IIHS). The Niro earned a score of “good” in all six IIHS crashworthiness tests including the new passenger-side small overlap front test. Vehicles that qualify for a IIHS TSP rating must earn “Good” ratings in five crashworthiness tests—driver-side small overlap front, moderate overlap front, side, roof strength and head restraint tests. It also must earn an “Advanced” or “Superior” rating for front crash prevention, and an “Acceptable” or “Good” rating in headlight testing. The IIHS testing parameters for a TSP+ rating require a vehicle earn “Good” ratings in six crashworthiness tests – driver-side small overlap front, moderate overlap front, side impact, roof strength, and head restraint – as well as a “Good” or “Acceptable” rating in the passenger side small overlap front test, an “Advanced” or “Superior” rating for front crash prevention, and a “Good” rating in headlight testing. This new rating fro the Niro from the IIHS increases the total number of Kia vehicles with 2018 Top Safety Pick and Top Safety Pick Plus ratings to nine making Kia vehicles some of the safest on the road today. 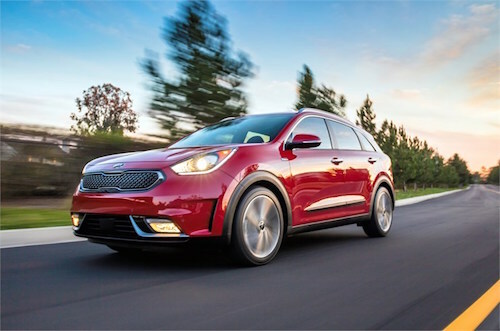 Our Kia Dealerships in Smyrna and Chamblee are pleased to offer a wide selection of new Kia Niro models to choose from as well as many other top rated Kia cars and SUVs. We invite you to explore our new Kia inventory online or stop by for a test drive soon.